Definition at line 33 of file TitleArray.php. IResultWrapper $res A SQL result including at least page_namespace and page_title – also can have page_id, page_len, page_is_redirect, page_latest (if those will be used). See Title::newFromRow. 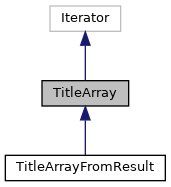 Definition at line 40 of file TitleArray.php. References $res, null, and Hooks\run(). Referenced by PrefixSearch\defaultSearchBackend(), MovePageForm\doSubmit(), BacklinkCache\getCascadeProtectedLinks(), WikiPage\getCategories(), WikiFilePage\getForeignCategories(), BacklinkCache\getLinks(), Category\getMembers(), Title\getSubpages(), and HTMLCacheUpdateJob\invalidateTitles(). Definition at line 55 of file TitleArray.php.